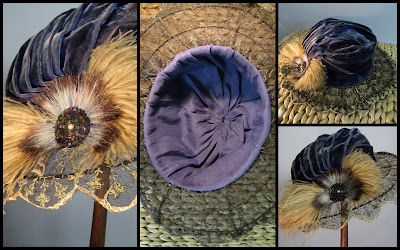 After having to set aside work on the c1910 wire hat earlier this semester, I have finally found time to work on it once again, and this time it will be completed. The frame was constructed of millinery wire and wired together - you can see the thin silver wire holding the elements in place in the photo above. The metal wire on the brim was thread wrapped to cover it. Where the sideband attaches to the brim the connection was wrapped with black hug snug hem tape. The brim was then sandwiched between two layers of black silk organza. Antique black lace was carefully gathered and applied to the top of the brim, and the edges of the silk organza were scalloped and pinked at the edges to mimic the scallop of the lace. Next, dyed royal blue rayon/silk velvet will be draped over the sideband and crown and trim applied. The interior will be lined in dyed royal blue china silk, and a black grograin sideband sewn in place. Where the lace edges met, the lace motif was carefully cut out and whip stitched to hide the seam. 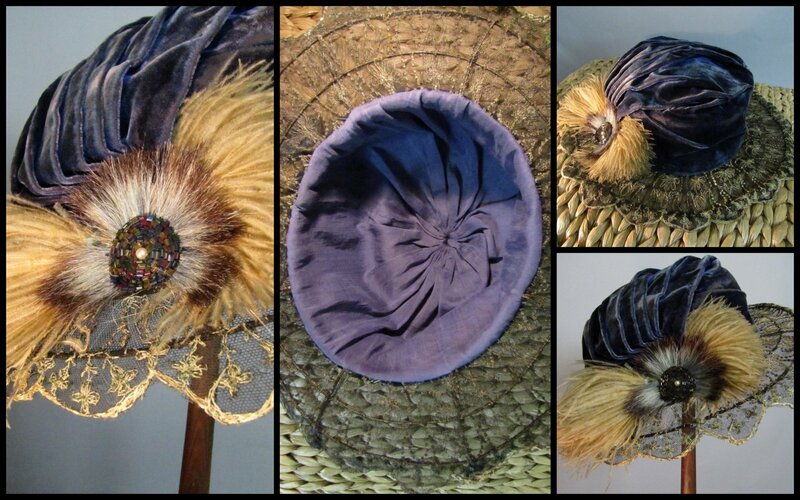 Above is a picture of the original hat upon which my reproduction is based. This looks amazing so far! I can't wait to see how it looks completed. Keep us posted!